This West Penwith page, one of my Countryside pages, is mostly concerned with walks on the high moorland of Cornwall's Wild Far West. You might expect these walks to have much in common with those on Bodmin Moor. That is not the case. For a start the hills are lower, rising to only around 700 feet compared with Bodmin Moor's 1400 feet. Then the going is very different - less bog and marsh but much more heather and furze. And paths can be quite indistinct in many places. Views are great, often of both coasts. Separate pages cover Bodmin Moor and Inland Trails. One sees and hears so much about the Cornish coast, its soaring cliffs, its sandy beaches, its sheltered harbours and the wonderful Coast Path, that it is easy to miss the fact that there is lots of glorious scenery and some superb walking inland too. Thank goodness that's the case because there are times - at school summer vacation and bank holiday weekends especially - when the roads to the coast just get too congested. At these times we tend to head for the moors or the mining trails and get well away from the crowds. I have divided the Countryside section into three. 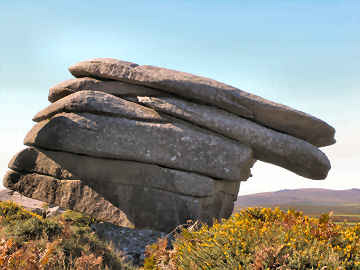 On this page West Penwith covers mostly the high moorland to the west of St. Ives and Penzance. Elsewhere Miscellaneous includes clay country around St. Austell and some of the great estates; these walks tend to be easy. Elsewhere Rivers flow to both south and north coasts and I include walks in their valleys, again easy walking, I have separate pages for Inland Trails and for Bodmin Moor. 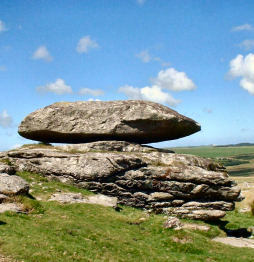 Bodmin Moor speaks for itself, high open moorland that rises at its highest to almost 1400 feet; in places the walking tends to be rocky, steep and difficult but the views are often of both coasts. Since few paths are waymarked on the moor, it is wise to carry both a large scale map and a compass. 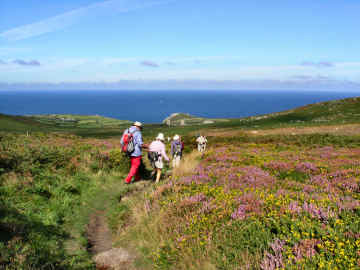 The Inland Trails page includes the Tinners Way, the Zennor Churchway, the Saints Way, St. Michael's Way, the Camel Trail, Clay Trails, the Land's End Trail, Mark Camp's enterprising Copper Trail and the Mining Trails. The latter reflects my own interest in industrial archaeology; since these trails all follow former horse-drawn tramways that served the tin and copper mines, walking (and cycling) is easy. A word of warning on Open Access land.. I soon discovered that this may not be quite as straightforward as that. I have encountered barbed wire fences, locked gates and even one gate on Bodmin Moor, leading to access land, that has a 'no walkers' sign on it. And, in West Penwith, where moorland is lower, I have found impenetrable furze and bramble. So don't expect it to be easy. Other than walking the coast of West Penwith as part of my completed Cornish Coast Path project, and visiting some of the antiquities in the area, I had previously done little walking there and had spent relatively little time beyond St. Ives and Penzance/Newlyn/Mousehole. My first proper inland walk was one in July 2006 from St. Buryan in search of Cornish Crosses and the stone circle at Boscawen-ûn. It was only when I developed such a love of the high moorland of Bodmin Moor that I thought it time to explore some of West Penwith's moorland and to look for some of the more out of the way antiquities hidden away up in the hills. West Penwith's moorland has proved to be very different from that of Bodmin Moor in more ways than one. For one thing, on Bodmin Moor you have only occasional glimpses of the sea. On the West Penwith moors wherever you are you usually have a view of the sea on one coast or the other, sometimes both. The other big difference, the vegetation, makes planning a walk a lot more difficult. 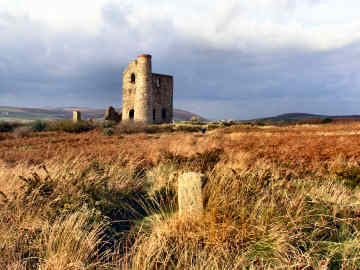 On Bodmin Moor, cattle, sheep and ponies graze on much of the open land and, although there is marsh in places, there is relatively little in the way of brambles, furze and bracken. West Penwith grazing seems to be restricted to enclosed farm fields and the result is that many of the hills are almost impenetrable. So, despite more moderate heights, the challenge may well be tougher. But the views are great! 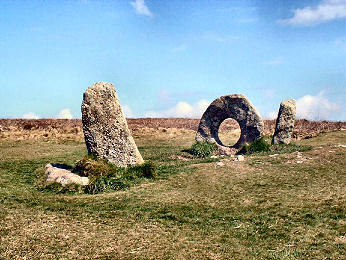 Mên-an-Tol, Mên Scryfa, Nine Maidens Stone Circle, Bosporthennis Homestead, Fogou and Quoit, Higher Porthmeor Standing Stone and Porthmeor Mine. This is one of two West Penwith walks that visit more antiquities than you will find anywhere else in so small an area of Cornwall, the other is a walk from Lamorna Cove that includes an even better stone circle, that of the Merry Maidens. However, the great advantage of this walk over that is that, whereas the Lamorna walk is mostly over farmland, this walk is on the high moorland with all the views you might expect of that. This walk starts from the small car park at Carn Galver Mine and crosses Watch Croft to reach the track from Bosullow to Nine Maidens Common. Along this track are Mên-an-Tol and Mên Scryfa. On Nine Maidens Common are the Four Parish Stone and the Nine Maidens stone sircle. The common is at its best in summer with the heather in bloom. You then cross the common to Brook Cottage to reach the antiquities on Bosporthennis land. A path leads to the road near Higher Porthmeor. Finally, you follow the Zennor Churchway back to the Carn Galver Mine car park. Apart from all the antiquities, this is a walk of great variety with long views once up on Watch Croft, a little visited hill. Going is not easy everywhere and the walk can feel like much more than its less than 7 miles. In places the route can be difficult to follow, particularly in the area of Bosporthennis, but do persevere, it's well worth it. Researched in November 2012, I had previously done the component parts on many occasions. I had not, however, done it all as one single walk. Nor did I this time; instead I made two round walks of it. The first took me up Watch Croft, down to Bosullow, up to Nine Maidens Common and back down to Carn Galver Mine car park. The second took me up along Carn Galver to Nine Maidens Common, across the common to Brook Cottage, then via Bosporthennis to Higher Porthmeor and back on the Zennor Churchway. On each walk I was surprised by the state of the path between Watch Croft and Carn Galver, used for a shorter variation of the main walk. Heavy rain had washed much of the path away, down to the rock, and going was now difficult. I saw where the National Trust (I think) had put in wooden fencing, where the path approaches Nine Maidens Common, as part of a grazing project. The fence and a gate had been destroyed. I know that Save Penwith Moors is strongly against enclosure but they definitely don't destroy, they campaign and negotiate, often successfully; could it be the motor cyclists who like to ride up here? The antiquities around Bosporthennis are not especially easy to find, the others are all straightforward enough. To be on the safe side, I have included grid references for all antiquities, hard to find or easy. Description - Antiquities - Statistics - Information - Route Directions Bosporthennis Fogou - or Beehive Hut? Mên-an-Tol: The stone with the hole, pictured left and found at 42647/34948. 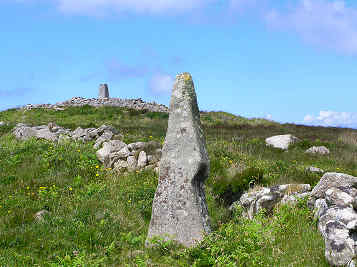 Four Parish Stone: Where the four parishes of Zennor, Morvah, Gulval, and Madron meet, is a flat stone with a cross cut on it. Legends connect it with King Arthur and with Saxon kings. Nine Maidens: Isolated circle, 11 of the original 19 stones at 43420/35144. Bodrifty Iron Age Village: At 44395/35420 remains of 6 huts within a banked enclosure. From the storyboard at 44467/35408 yellow waymarks lead to a recreated iron age round house at Bodrifty Farm. Bosporthennis: The area to the south and west of the farm is filled with antiquities. Major sites are the fogou (or is it a beehive hut?) at 43778/36052. Adjacent is a homestead at 43798/35997. Also a fallen quoit with unusual capstone at 43575/36551. Roundhouse and cairn remains in many locations. 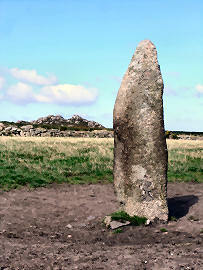 Higher Porthmeor: 8 Foot standing stone at 43250/37373. Fascinating farm buildings. Porthmeor Mine remains to west. Distance: 6.85 miles but 8.35 miles to include Bodrifty Iron Age Village. Highest Point: Watch Croft at 745 feet. Nine Maidens stone circle at 740 feet. Biggest climb: 290 feet up Watch Croft. 190 feet Bosullow to Nine Maidens. Steps: Up none. Down 16. Stiles: 30, of which most granite, most cattle stiles, all after Brook Cottage. Open Access: All Open Access as far as Brook Cottage, some after that. Road: Approximately ½ mile in all. Footing: Mostly good on paths and tracks to the beginning of Nine Maidens Common. Some difficult ground from there to Brook Cottage. Mostly good on paths and on grass to the road before Higher Porthmeor. Generally good, mostly on paths, the rest of the way back to finish. Difficulty: Moderate but with some awkward spots. Map: OS Explorer 102 Lands End. Parking: Start from Carn Galver Mine Car Park on the B3306 St. Ives to St. Just road at 42135/36439. Getting There: B3306 St.Ives to St. Just road. CP is on R about 1½ miles after Gurnard’s Head Inn and is clearly identifiable by the engine house remains. Intermediate parking: Bosullow, on the Morvah to Madron and Penzance Road, at 41887/34429. Also trackside parking on the track from Tredinnick, near Bodrifty iron age settlement. Transport: First bus 300, along B3306 in summer. Refreshments: None on the walk. Nearest Gurnard’s Head Inn. Fully detailed walk directions are in pdf form. They include many grid refs. Click here. 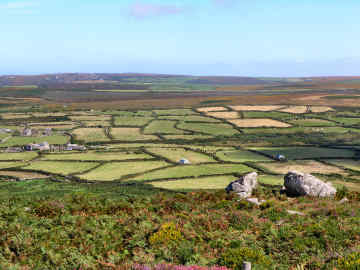 In mid-July 2006 I worked out a figure-of-eight walk on the southern side of the West Penwith peninsula that promised easy walking on paths clearly shown on the Ordnance Survey Explorer sheet 102, a short section of coast, several Cornish crosses, some promising-looking farms and, importantly, Boscawen-ûn stone circle, a new one to me. I reckoned I would have an easy 8 miles in all, a 5-mile loop south from St. Buryan, then a 3-mile loop to the north. I had reckoned without Cornwall County Council, which is more concerned with the Coast Path and Trails than with signing ordinary paths where they leave roads, and without farmers who here are unconcerned with keeping paths open. My morning loop, to St. Loy's Cove, went well enough, just one problem with impossible access to a path and another with paths obliterated by fields of hedge-to-hedge maize. The afternoon loop, to Boscawen-ûn, took me miles out of my way, hardly ever finding the expected paths; I made it worse by trying a short cut which had me scrambling through gorse and brambles. However, I found everything I was looking for (eventually), loved the brief coastal views, watched cricket on television during two coffee breaks in the St. Buryan Inn opposite the church, and got in more exercise than I had expected. So, on balance a walk worth doing, however awkward. Stile and Cross built into hedge near Adams Hill On OS Explorer 102. Some parking in St. Buryan. Sometimes my map reading lets me down badly. This walk was one of those occasions. In September 2006 I had parked in the little car park by the ruins of Carn Galver Mine, planning to find a beehive hut I had read about in the area of Bosporthennis. I had pinpointed (I thought) its exact location from the co-ordinates quoted on both Megalithic Portal and the Modern Antiquarian. My intention was to approach it by climbing Carn Galver and Hannibal's Carn in order to line up a precise direction of approach. I failed. I found the settlement remains where it should have been but I never found the beehive hut. No matter, I had a great if difficult walk. The walk up Carn Galver was fairly easy. I walked the length of the ridge and back for the most glorious views. Getting up Hannibal's Carn might have been easier if I had had Hannibal's elephants; furze and brambles made for a real struggle. From the top I located Bosporthennis settlement but then came failure. I then tried to find a path to take me towards Nine Maidens. More failure, it petered out in impenetrable growth. So I made my way back by Bosporthennis Farm, a fascinating place. Once it must have been important. An original medieval farmhouse had been abandoned, as had a row of Georgian cottages. Field walls are massive, some of carefully coursed granite blocks. On a later walk I found the beehive hut (or fogou) at 43778/36052. In October 2007 I enjoyed two walks from the car park at Carn Galver Mine, the first on a dull day, the second in good sun for better photos. 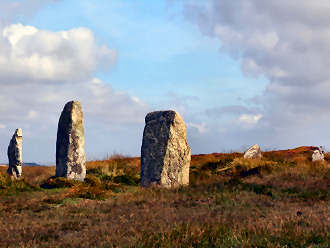 The first walk took me up the clear path on the west side of Carn Galver to the Nine Maidens stone circle. From there I headed towards Brook Cottage to find the first of a long line of boundary stones that runs across Bosporthennis Common towards Higher Kerrowe. A detour took me to Bodrifty for the little known iron age roundhouse settlement. On Bosporthennis and Treen Commons I found more standing stones and a barely visible cairn on the Beacon. I returned to the car along the road from Treen. My second walk deviated at the Nine Maidens to go via Boskednan for a couple of mine engine houses and via Tredinnick for some attractive cottages. I then spent more time at Bodrifty Iron Age Settlement before heading over Bosporthennis, Porthmeor and Treen Commons to Treen. This time I took the footpath through Higher and Lower Porthmeor farms and Bosigran farm, passing a standing stone at Higher Porthmeor and then mining and settlement remains beyond Bosigran farm. Later I took an extra short walk up Rosewall Hill. On both occasions I tarried at the now first class Gurnard's Head Inn. Bosporthennis field pattern from Hannibals Carn OS Explorer 102. Much on Open Access land. I learned about Baker's Pit from a promotion for heathland restoration and an article in Cornwall Today. Not that the Cornwall Wildlife Trust nature reserve was what interested me, rather I wanted to see what I could find of the former china clay workings. When I looked at OS Explorer 102 to locate it, I realised there was a lot of other interest not far away: the other Castle an Dinas iron age hill fort (the well known one is near St. Columb), an 18th century folly on it and a nearby working granite quarry. So in early October 2007 I parked in the car park at Chysauster and set off on a walk that should have taken three hours but took five. I set off down the road for half-a-mile then took a path (initially through woodland) north-east to Gulval Downs. There I followed a path south-east to Castle an Dinas granite quarry, an impressive working site. Next it was roughly north east up to Castle an Dinas hill fort, easily spotted not by its rudimentary earthworks but by a folly known as Rogers Tower. The banks and ditches are badly degraded but the views are magnificent in all directions. Next I headed north west to find Baker's Pit and associated engine house and dries. I had intended to make my way directly back to Chysauster. Instead I made it dreckly - by Woonsmith, Conquer Downs, Kerrowwell Cottage and Carnaquidden Farm. A rewarding walk but tough in places. Castle an Dinas quarry is still a working granite quarry with some impressive modern machinery. I have been able to find out nothing about Rogers Tower except that it is thought to have been built in the 18th century, a time when so many follies were constructed, by a local land owner named Rogers. Partly built on the outer bank of Castle an Dinas hill fort, the views looking south over Mount's Bay are superb. 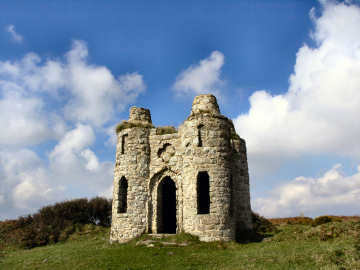 The folly looks a little like a child's sandcastle. China clay was worked at Baker's Pit from about 1758, not long after its discovery by William Cookworthy at Tregonning Hill in 1746. It acquired the name Baker's Pit when William Baker bought it in 1868. 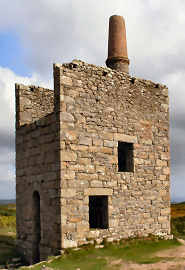 It was Baker who built the engine house that stands near the main pit. On Baker's death the business was acquired by his partners Loverings, eventually to become part of English China Clays. The pit and associated works finally closed in 1942. Not far from the pit you can see a tall brick chimney; behind it are the old clay dries. 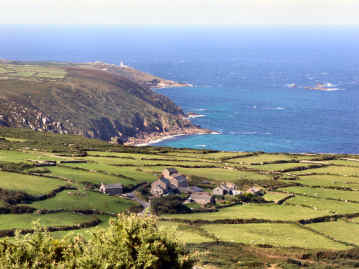 Jane and I did this short, easy walk in West Penwith after visiting Bonython Garden in September 2006. It is from Classic Walks Cornwall, volume 1 number 6. In its three or so miles you first follow a firm track, roughly north-east, past abandoned farm buildings and massive field walls. Leave the track to the right for a short detour to Mên-an-Tol and to the left for Mên Scryfa. At the end of the track you pass another abandoned farm building then out on to the open land of Nine Maidens Common. Here you climb gently, roughly south-east, to reach the Nine Maidens stone circle. Then you follow another path in a gentle southerly curve to reach the remains of Ding Dong mine, its engine house visible for miles from much of West Penwith. Finally a path descends, just south of west to the road at Lanyon Farm, not far from the starting point. Park by the road at Bosullow, where there is space for several cars. On a lovely warm but breezy day in September 2006 I set out to find three quoits - exposed Neolithic burial chambers or portal dolmens- that I had not seen before. I was delighted to be able to park inexpensively in one of my favourite villages, Zennor, and before setting out I visited the church and took a number of photos in the village. My route took me up Zennor Hill (a real struggle through furze), along to Zennor Quoit, up Sperris Hill, across to the Try Valley, up Mulfra Hill and back along an easy path to Zennor. Zennor Hill is fairly tough going. The very narrow path to the top is through sometimes shoulder-high furze but the views and the Carne rock formations are worth it. The path to Zennor Quoit - very impressive - is easy and obvious but the way up and down Sperris Hill is through furze and heather. I never did find Sperris Quoit and only later learned that there is almost nothing to see. Tracks and field paths then lead to Mulfra Hill; the path up it is obvious and the climb easy. 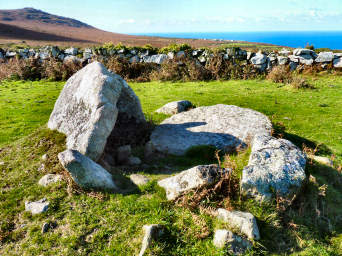 Mulfra Quoit is slightly less impressive than Zennor but still well worth seeking out. 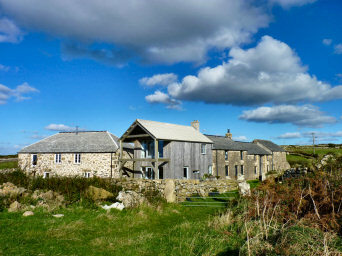 The site has great views of St. Michael's Mount and across Mount's Bay to the Lizard. To my pleasant surprise I met three other walkers - and a cyclist - up there. Afterwards I had a coffee in the excellent Tinners Arms in Zennor Village. Precarious granite outcrop on the Carne, Zennor Hill On Ordnance Survey Explorer 102, mostly on Open Access land. The coastal part of this walk is already on my Cornish Coast Path page. My main purpose was to explore country and villages inland from the coast. So the glorious coastline on a warm sunny day and the superb collection of mine remains along the coast were really just an added bonus. I parked by Pendeen Watch and first walked the coast path as far as Kenidjack Head, then turned inland to get lunch at the Queen's Arms in Botallack. Along the way, apart from taking dozens of photos, I found the former Botallack Mine Count House. After lunch I set to the real purpose of the walk, Poldark and fogous. I succeeded in the first part, failed in the second but found an unexpected bonus. 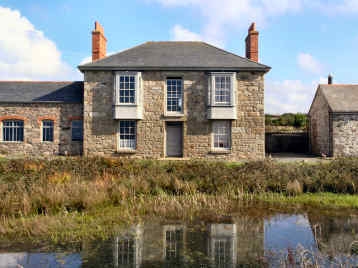 In the BBC TV series, Ross Poldark's Nampara was largely a composite of Botallack Manor and Pendeen Manor. I found both with no trouble. 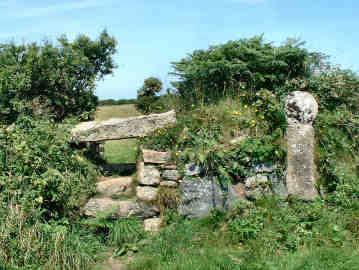 What I failed in was finding Boscaswell fogou and Pendeen Vau fogou; the first I just missed, the second is on private land at Pendeen Manor and the farmer was not in to ask permission. The bonus was at Boscaswell where Dave Weddle (he appeared in Wild Cornish Summer) showed me the holy well and a bronze age pit that he and others recently found on the edge of the village. 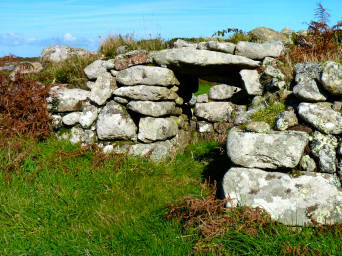 I returned later for Pendeen Vau fogou, now on my Antiquities page, I have also since found Boscaswell fogou. All this is on a fully detailed Coastal Round Walk from Pendeen. 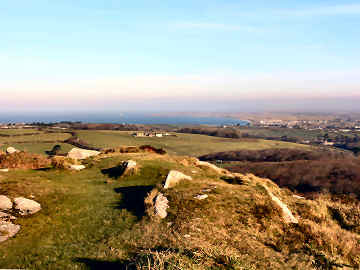 In February 2007, on a gloriously warm and sunny day, I went back to West Penwith to revisit Chapel Carn Brea, St. Euny's Well and Carn Euny Iron Age village. I parked below Chapel Carn Brea (a car park much favoured by dog walkers) and after walking up it, came back past the car and crossed the road to the path, heading roughly north-east, to the well and iron age village. It always surprises me to find no-one else at such a fascinating spot as Carn Euny though, to be fair, it is not very easily accessible by car. On the way back, just after the well, I decided to turn up a path morth-west onto Bartinney Downs. The downs, like so much high land in West Penwith, are covered with furze and brambles but, happily, paths have been cut through for horse riders, presumably by the admirable BHS Access Cornwall. On the way up the hill (740 feet) I found a probable cairn. At the top was the almost unidentifiable iron age Bartine Castle. There was a another possible cairn close to the trig point. I continued north towards Bartinney, turned west to Numphra Common, then south to Tredinney Common to find a boundary stone. The path then took me back to close to my car park. When my sisters Mary and Frances came to stay in November 2007 to help me celebrate my 70th birthday, the weather was kind and we all took the opportunity to expand a short walk I had done recently. We parked in the Rosewall Hill car park, intending to include Rosewall Hill, Trink Hill, lunch in St. Ives and the coast path back to Hor Point. We had not allowed for the lack of clear paths on the hills or for their unevenness and tight scrub cover. In the event, reaching Halsetown after 4 hours, we had to omit St. Ives and the coast path. It was a glorious, if chilly, day and views over St. Ives Bay were superb. Mine remains on Rosewall Hill are of Ransom United. Climbing to its eastern peak was easy, the descent less so; we should have gone to the lower of two chimneys to find the path so we had a circuitous struggle. Easy then, by Bussow Farm and southwards, to the engine house near Cripplesease. Footing both up and down Trink Hill was awkward but, in due course, we reached Balnoon. Busy road then until we found the path to Halsetown. We clearly couldn't complete our planned walk before dark so, after coffee in the Halsetown Inn, by road back to the car, by car to St. Ives and pasties on the harbour wall. A lovely day even if uncompleted. 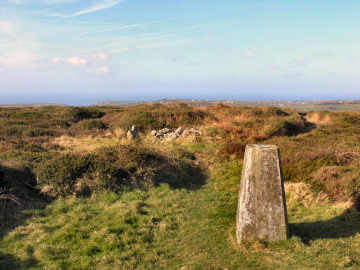 Although the iron age hill fort that tops Trencrom Hill - also known as Trecrobben Hill - provides the historic and archaeological interest, the unfailing attraction of the hill is the magnificent views from the summit, despite its moderate height of only around 700 feet. As you look clockwise from the west you see Rogers Tower, Trink and Rosewall hills, St. Ives Bay, the Hayle Estuary, Godolphin and Tregonning hills and St. Michael's Mount. The feeling you get from this vast panorama is utterly ravishing. I have been up on Trencrom Hill on many occasions: first when walking St. Michael's Way from Lelant to Marazion and later when walking the Land's End Trail between Bosullow and St. Erth. If you are just visiting the hill itself, you don't have to walk that far; there is a small car park at the southern foot of the hill, on a minor road from Lelant Downs towards Cripplesease. On one of the paths leading north off the hill I discovered a well, sealed off with a padlocked metal cover. Apparently it is reputed to have holy properties but its great depth is considered to be a danger, hence its sealing. Below the hill, to its north-west, is the attractive hamlet of Trencrom with remains of a defunct mine, Wheal Alice. This 10 mile round walk in April 2008 had several purposes. First to take another look at the ruination of the dreaded Land's End (recently slightly improved). Second to find Tregiffian Chambered Cairn. Third to walk a bit of coast I had only seen in fog. Finally to revisit Sennen Cove in better weather than last time. I parked in the vast car park at Land's End (£3 is acceptable) and set off on the first stage of the planned west to east Land's End Trail as far as Chapel Carn Brea. This took me over fields to above Sennen Cove, over more fields and through farms to Tregiffian, where I saw the cairn, finally up Chapel Carn Brea. From there I devised my own return route, first using a part of the Penwith Round to Nanquidno Downs, then heading back to Tregiffian to join the coast path above Gwynver beach. There, to my surprise, I spotted the medieval field system in the photo. 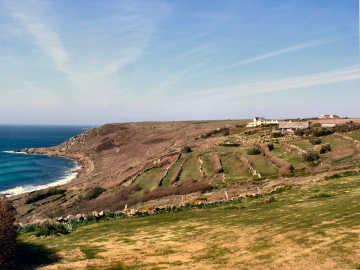 Along the coast path to Sennen I found more ancient fields on the cliff edge. In Sennen I enjoyed good soup at The Beach café and got some better photos of Sennen Cove. By Pedn Mên Du I took a stupid tumble; three days later I am still suffering bruised ribs and a black eye! Further on I was delighted to see that the National Trust have cleared impressive Maen Cliff Castle. A great walk on a lovely day. Click here for a similar fully detailed Coastal Round Walk. Although I had been close to Watch Croft on several occasions, I had never actually been up West Penwith's highest hill - 830 feet. I had three reasons for going there in June 2008: to find a cairn and a standing stone, to see the mine remains, and to find out whether a path to Carn Galver, shown on the 1996 OS map, but not on the 2005 one, still exists - I couldn't find it!. I parked at Bosullow, by the path that leads to Mên-an-Tol, walked a little way up the Morvah road and turned right on the lane to Garden Cottage - a surprise to find in such a location but probably the former mine count house. The winding engine house was easily accessible but I also found a large number of well hedged shafts down the path leading towards the sea. Getting to the summit of Watch Croft was a little more difficult but, opposite the entrance of Garden Cottage, I spotted a narrow path winding through the heather and bracken. Be careful here, the land is riddled with ancient uncapped mine shafts. At the top the ground was easy and the standing stone obvious though only about 6 feet tall. To the north of it, on the summit, is a cairn with a trig point on it. I assume it to be a burial cairn but, if so, it has been much messed with and a recent small enclosure constructed on one end ot it. 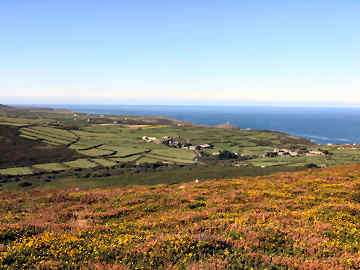 Views are terrific: across Mounts Bay to the Lizard, south to Ding Dong Mine and north to Pendeen Watch. The path to Carn Galver no longer exists.